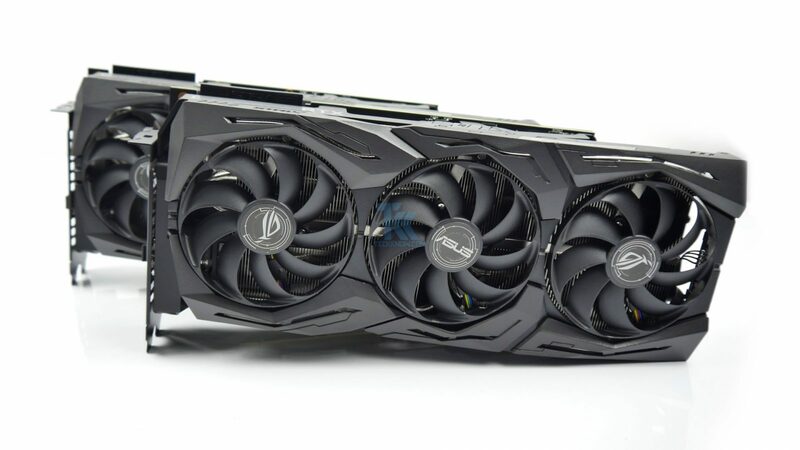 ASUS ROG cards always overbuild and performed like a champ, and the latest offings are no exception, both ROG STRIX RTX 2080 and RTX 2080 Ti was excellent both in terms of performance and build quality. The STRIX RTX 2080 Ti custom PCB with 16+3 phase is much more powerful than NVIDIA’s Founders Edition 2080 Ti uses 13+3 power phases design, also VRM is much better quality too. The ROG STRIX RTX 2080 also not bad either an improved 10+2 VRM which also more than enough for RTX 2080. Though cards already run at their maximum clock speed thanks to GPU Boost 3 also automatically pushed RTX 2080 Ti to 1800-1850 MHz range depending on the game and the RTX 2080 even reached up to 2GHz, which make overclockers like us little disappointed, as we didn’t have to do much. Performance wise both card was great with STRIX RTX 2080 Ti can run games at 4K 60 FPS with a max setting which around 30% performance increase compared to GTX 1080 Ti and twice as fast AMD’s RX Vega 64. On the other hand, ROG STRIX RTX 2080 is a totally different story, the performance difference STRIX RTX 2080 and STRIX GTX 1080 Ti which we review a few months back was negligible at best. So if you are not very keen on all the ray tracing stuff then the previous gen GTX 1080 Ti will be perfectly fine for you. Now talking about ray tracing, we had our first experience with ray tracing with Battlefield V. Now NVIDIA introduces RT cores, which accelerate ray tracing—a rendering technique that can give you realism that’s impossible with today’s rasterization rendering. Unlike in the past, NVIDIA’s new technology is designed to work with various APIs, from multiple vendors (Microsoft DXR, NVIDIA OptiX, Vulkan Vulkan RT), which will make it much easier for developers to get behind ray tracing. At this time, only one game has RTX support, Battlefield V but the performance number not going to impress you as enabling it will impact the performance significantly as you see on our benchmark earlier. To NVIDIA credit running real-time ray tracing even with 4x Titan V was very difficult, the matter of fact is that one card can run it is a huge step forward, but I don’t think I am going to pick little more eye candy for double frame rate, yes ray tracing looks gorgeous but I think it will take at least two more generation of GPU development before we can comfortable enable it. Both ROG STRIX RTX 2080 and RTX 2080 Ti features the same improved DirectCU III triple fan cooler which runs cool and quiet. But the cooler design is now 2 years old and didn’t look fresh and it still not have an addressable RGB lighting, it has only RGB lighting, so no more Rainbow effect for you. I didn’t understand why? pretty much all ASUS motherboards have addressable RGB lighting. 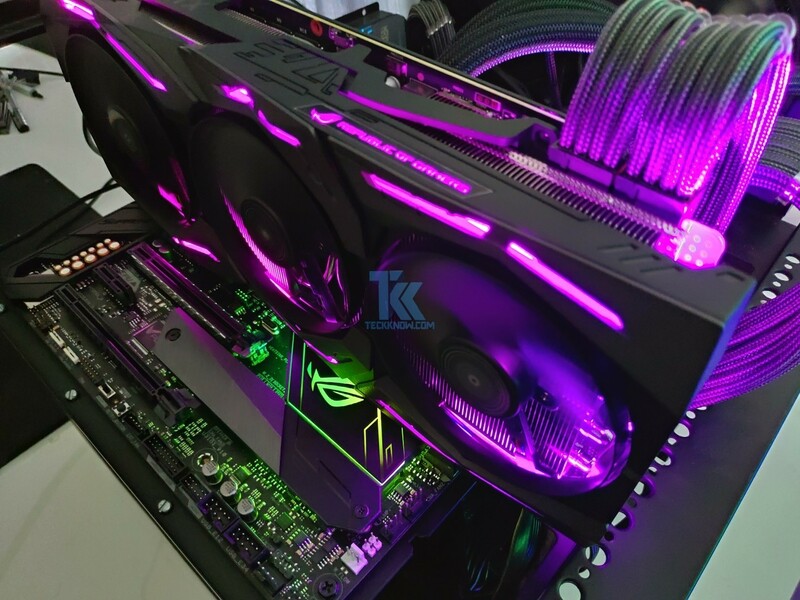 Now talking about cooling we have to mention the dual-BIOS feature, other than recovering from a bad BIOS flash, the second BIOS is configured to run the card in “quiet mode” which reduce the fan speed and enable the fan-stop-in-idle feature. The first is “performance mode” which aggressive fan speed carved for better performance. Other than the fan speed difference both BIOS is identical setting and clock speed so you can use either as you like with any performance difference. If we talk about price it’s crazy, the ROG STRIX RTX 2080 Ti comes with a price of $1,300 or ₹12500 it is expensive and justifying it will be very hard but unlike most other RTX 2080 Ti including Founders Edition, the ROG STRIX RTX 2080 Ti offers few unique features like dual bios and excellent cooling performance. The ROG STRIX RTX 2080 also not a cheap card as it currently priced around $850 or ₹85000. Overall both ROG STRIX RTX 2080 and RTX 2080 Ti extremely well built and performing cards probably one of the best in the market, probably accept the looks. We are giving the ROG STRIX RTX 2080 our GOLD AWARD and the ROG STRIX RTX 2080 Ti is getting out Performance Award as is it currently unchallenged in terms of GPU horsepower.